In chronicling the adventurous life of legendary CIA operative Edward Lansdale, The Road Not Taken definitively reframes our understanding of the Vietnam War. In this epic biography of Edward Lansdale (1908- 1987), the man said to be the fictional model for Graham Greene's The Quiet American, best-selling historian Max Boot demonstrates how Lansdale pioneered a 'hearts and mind' diplomacy, first in the Philippines, then in Vietnam. It was a visionary policy that, as Boot reveals, was ultimately crushed by America's giant military bureaucracy, steered by elitist generals and blueblood diplomats who favored troop build-ups and napalm bombs over winning the trust of the people. Through dozens of interviews and access to never before-seen documentsincluding long-hidden love lettersBoot recasts this cautionary American story, tracing the bold rise and the crashing fall of the roguish 'T. E. Lawrence of Asia' from the battle of Dien Bien Phu to the humiliating American evacuation in 1975. Bringing a tragic complexity to this so-called 'ugly American,' this 'engrossing biography' (Karl Marlantes) rescues Lansdale from historical ignominy and suggests that Vietnam could have been different had we only listened. 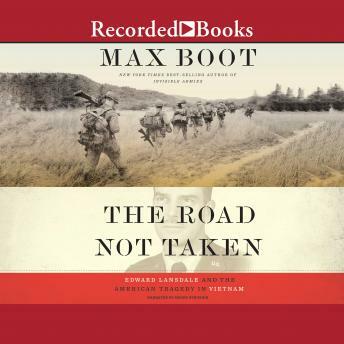 With reverberations that continue to play out in Iraq and Afghanistan, The Road Not Taken is a biography of profound historical consequence. I thought in general, the book was good. Not what I expected and didn't have enough substance for some of the claims it was making about Edward Lansdale. I wish the book would have given deeper insights as I found it was just touching the surface of a very interesting man.